Paperback, 7 x 10 in. / 288 pgs / 110 color. "In today’s era, a work of art should be a rifle pointed straight at the viewer." Edited with text by Ruth Estévez, Agustín Diez Fischer, Miguel Ángel López. 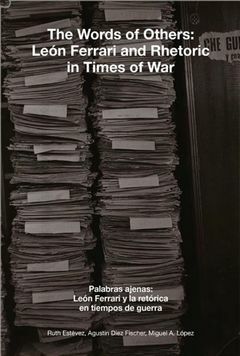 Text by Pedro Asquini, Cora Gamarnik, Andrea Giunta, Leopoldo Maler, José Antonio Sánchez. Argentinian artist León Ferrari (1920–2013) is best known for his politically charged work that challenged authoritarianism of all types, from the Argentinian dictatorship and the Catholic Church to the US war in Vietnam. The Words of Others provides a wide-ranging survey of the artist’s literary collages using appropriated texts, produced from 1965 to 2013—a body of work which represents a kind of experimental writing at the intersection of visual arts, performance, theater, literature and activism. The starting point of this extensive body of work was Ferrari’s landmark 1966 piece “The Words of Others” (Palabras Ajenas). Performed only twice, in 1968 and 1972, this literary collage is an imaginary dialogue among 160 historic figures, composed of fragments from contemporary news-wires and historical texts. Exploring a little-known aspect of Ferrari’s work, this volume includes seven essays by academics from Latin America and Europe with previously unpublished primary source documents (press notes, photographs and correspondence, among others), and more than 100 illustrations. Published to accompany Ferrari’s exhibition at REDCAT, Los Angeles (which will feature the first US performance of “The Words of Others”), this book is a comprehensive reflection on the intersections between artistic practice, media and political violence in Latin America. FORMAT: Pbk, 7 x 10 in. / 288 pgs / 110 color.